Previous post: Keep Your Heart Healthy and Happy! If you’ve ever gotten a ‘Lice Alert’ from your child’s school or found the little buggers on your own, you’ve felt that sinking feeling that maybe your child has been infected. You are not alone. Knowing about the different types of lice, how to treat and help prevent it, and keeping a watch out for lice is your best defense. There are three types of lice- head lice, body lice, and pubic lice. Head lice are a very common problem, especially for kids. They’re contagious, annoying, and sometimes tough to get rid of. The head louse (the singular of lice) is a tiny, wingless parasitic insect that lives among human hairs and feeds on tiny amounts of blood drawn from the scalp. An infection with head lice is technically called pediculosis. Lice eggs (nits): These look like tiny, yellow, tan, or brown dots before they hatch. They lie close to the hair shaft to keep warm until hatching. Nits also look like dandruff but they can’t be shaken off as such. After hatching (usually within 1-2 weeks after they’re laid) the remaining shell looks white or clear, staying firmly attached to the hair shaft. This is when it’s easiest to spot them. Adult lice and nymphs (baby lice): No bigger than a sesame seed, the adult louse is grayish-white or tan colored. Nymphs are smaller and become adult lice about 1 to 2 weeks after they hatch. Most lice feed on blood several times a day, but they can survive off the scalp for up to two days. Small red bumps or sores from scratching: This irritation ranges from mild to severe accompanied by a developing rash. Excessive scratching can lead to a bacterial infection in which case a doctor may need to prescribe oral antibiotics. You may be able to see the lice or nits by parting your child’s hair into small sections preferably with a fine-tooth comb. Check on the scalp, behind the ears, and around the nape of the neck. A magnifying glass and bright light may help as lice tend to avoid bright light. You should be able to see the lice move as well as identify lice and nits. If you aren’t certain whether your child has lice, ask the school nurse, your physician, or the local health department. Medicated shampoo, cream rinse, or lotions can be used to kill head lice. These may be found over-the-counter (OTC) or by prescription, depending on what treatments have already been tried. Medicated lice treatments usually kill the lice and nits, but it may take a few days for the itching to stop. 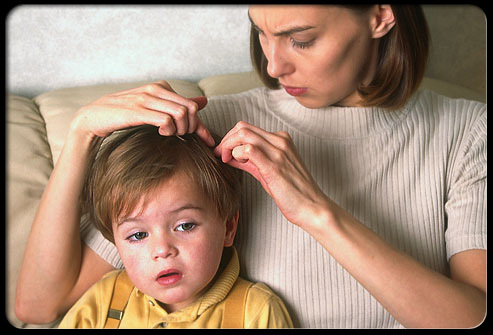 Oral medication (taken by mouth) may be prescribed by the doctor to treat very resistant lice. After treatment, your doctor may suggest combing out the nits with a fine-tooth comb and repeating treatment in 7-10 days to kill any newly hatched nits. There are also many natural ways to treat and prevent lice infections. Whilst we haven’t tried all of these methods, we’re inspired by this post from Jen Reviews which lists 15 ways to get rid of lice naturally…just remember to check the ingredients of anything you use first to make sure that you’re not allergic. Wash all bed linens and clothing that’s been recently worn by anyone in your home who has been infested. Use very hot water (130°F/54.4°C), then put them in the hot cycle of the dryer for at least 20 minutes. Vacuum carpets and any upholstered furniture (in your home or car), then throw away the vacuum cleaner bag or clean the vacuum canister. Soak hair-care items like combs, barrettes, hair ties or bands, headbands, and brushes in rubbing alcohol or medicated shampoo for 1 hour. Alternatively, you can wash them in hot water or even throw them away. REMEMBER: having head lice is NOT a sign of dirtiness or poor hygiene. Too often a stigma is placed with those who have lice or the parents of those children. The pesky little bugs can be a problem for kids of all ages and socioeconomic levels, no matter how often they do-or don’t- wash their hair or bathe. Look out for future blogs on lice-treatment products available at People’s Pharmacy.